The versatile Cotton Hunting Coat in neutral navy offers year round protection with a smart design that works with your lifestyle. Highly waterproof, protection is enhanced by applying a durable water repellent finish while the cool cotton construction and mesh lining ensures breathability on warmer days. Secure storage can be found in the double entry hunting pockets, and the adjustable hood and cuffs help to keep the elements at bay. 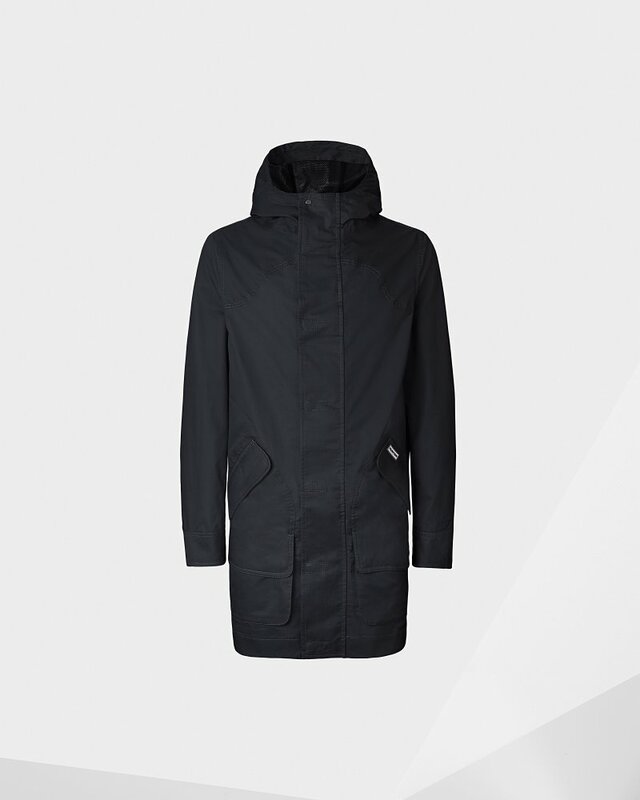 Rated 5 out of 5 by PeterDavidMartin from A great spring waterproof coat. Similar in construction to the rubberised version I already have, but with better pockets and a better hood. Light weight makes it easy to have with you if you are not wearing it. Yet to be tested in a downpour. Rated 5 out of 5 by Mike from Typical Hunter Quality Only owned for a few weeks - but already experienced some heavy rain while wearing; and as anticipated I stayed completely dry. Rated 5 out of 5 by Nick from Classic style with Hunter design I have been wearing my Hunter cotton Hunting Coat for our morning walks.it is well designed and waterproof. I was given one as a present previously, and was so impressed that I bought another one. Rated 5 out of 5 by Creative from Compliment Magnet I bought this a few weeks ago and every time I wear it I get compliments. I went for the Japanese special edition one (blue and white stripes). It's my favourite coat now. Rated 5 out of 5 by Krypto from Good fit, definitely waterproof. Bought just in time for a bit of atrocious weather. Kept me bone dry. Highly Recommended.